So, you’re bike-curious? Tempted to dip a toe into the two-wheeled water but not entirely sure how to go about it? Don’t know your commuter bikes from your tourers or your sportsbikes from your sports nakeds? Well, we’ve all got to start somewhere — and for you, that somewhere is right here! Motorcycling takes many forms, so it’s understandable that you’re likely to be a little confused as to which one is for you. People choose different bikes for different reasons. For some it’s simply a means of transport, a way to slice through the congested city centres. For others it’s about visiting exotic places, and seeing the world through the visor of a crash helmet, rather than from the sterile confines of an air-conditioned automobile. Then there are the adrenaline junkies who prefer to get their kicks on large, powerful sportsbikes on track days, getting the best from their machines in a responsible way and in a safe environment. So, we’re going to give you a few pointers when it comes to talking the talk but above all, to help you decide what you want when the time comes to swing your leg over the right bike for you. We’ve chosen the most popular genres of motorcycle — delve even deeper and you’ll soon realise that there’s a bike for everyone! Considered by many leisure riders as boring, commuter motorcycles are generally low capacity machines. Built to a budget, these bikes hark back to an age when motorcycling was appealing to the masses. In the 50s and 60s, motorcycling was considerably less expensive than motoring. Bikes were much more affordable than cars and so were often the only option for those on lower incomes. These days, commuter bikes are the preserve of city riders and professional users such as dispatch riders. Classic commuter bikes such as Honda’s CG125 and Suzuki’s GS125 are good for 100mpg and also make great learner bikes for those wishing to progress to a full licence and, ultimately, a bigger bike. These days there are too many bikes classified as commuters to list here, and often the definition is all about perspective. The lines get blurred, and if a commute includes motorway work, then anything goes. In town, less is more; a slim bike will slice through the gaps in the traffic and be cheap to run. Not much to say here really. But if your mate has just bought a commuter bike, ask what the fuel range is and how much they’ve saved on train fares. Then look enthused as they tell you about how they only fill the small tank once a week and how the faster commute has given them so much more spare time and money. Just don’t ask them too many questions to relating performance… focus on the practicalities! Sales of tall bikes with long-travel suspension, wide handlebars and rugged frames have really taken off over the last few years. Doubtless much of this is down to the exploits of Ewan McGregor and Charley Boorman — The Long Way Round and The Long Way Down inspired swathes of men of a certain age and income to buy BMW’s R1200GS in huge numbers along with all the matching kit and accessories. While sportsbike sales dwindled over the last 15 years, bikes such as the aforementioned BMW, KTM’s long-running Adventure series and, more recently, Triumph’s Tiger in its various guises, soared in popularity. 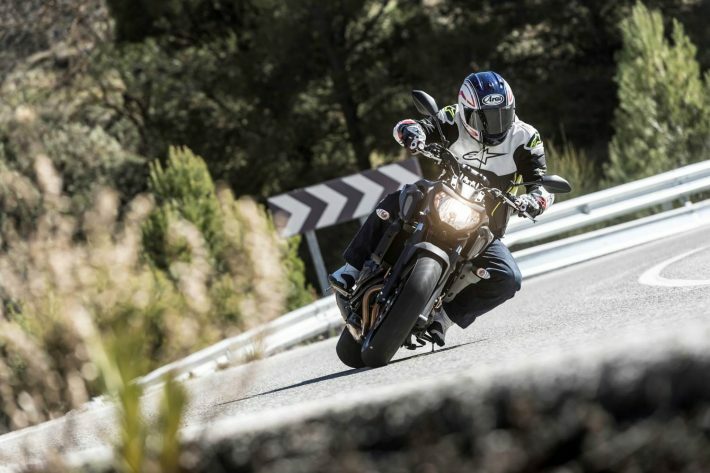 Some would say the main reason sportsbike sales are down is due to increasingly-congested roads and the demonisation of speed along with an increase in speed cameras and traps. But the ageing biking population has played its part too. According to the latest government figures, most motorcycle licences were issued to males aged 47. Adventure bikes are comfortable over a distance, and can go pretty much anywhere, opening up a world of new riding opportunities for riders more interested in exploring new places, rather than seeing how fast they can get there. Many are capable of taking pukka off-road tyres, too. Where once the only way to explore a country lacking in tarmac on two wheels was limited to heavy single-cylinder trail bikes that were a chore to ride on the road, the recent fascination with two-wheeled exploration has resulted in the motorcycle equivalent of the Land Rover, with a similar evolution in terms of performance and comfort. This has opened up a world of new opportunities for the adventurous, regardless of age and greyness of beard. KTM declined to provide bikes for McGregor and Boorman’s exploits — hindsight must still be haunting the (former) marketing manager now — BMW GS sales went through the roof, especially in the UK. Ask any of your adventure riding mates if they’ve done the excellent BMW Off Road Skills course — then mention how capable the latest breed of R1200GS machines are, especially when fitted with Continental TKC80 off-road tyres. To the uninitiated, these bikes look like racing machines with lights and numberplates. And that’s actually not too far off the mark as most of the machines are the starting point for bikes in the Superbike (1000cc) and Supersport (600cc) production racing classes around the world. These two traditional engine sizes remain, for now at least. The 1000cc category is pretty much dominated by BMW, Honda, Kawasaki, Suzuki and Yamaha with the likes of Ducati and Aprilia producing exotic machinery for those with good taste and an even better income. Most of these bikes are around 180bhp and weigh around 180kg — so with 1bhp for every kilo, they’re as fast as you’d imagine. 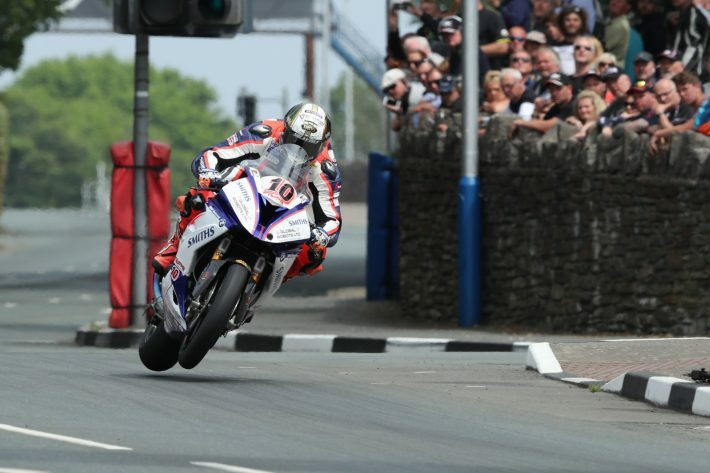 To put into context how good these standard machines are on the road, Peter Hickman recently lapped the Isle of Man TT course on a Superstock-spec BMW S1000RR at over 134mph! 08/06/2018: Peter Hickman (BMW/Smiths Racing BMW) at St Ninian’s during the Pokerstars Senior TT race. PICTURE BY DAVE KNEEN/PACEMAKER PRESS. The smaller 600cc class used to be incredibly popular but alas there are now only two manufacturers making these sweet-handling middleweights. Honda, Suzuki and Kawasaki have all ditched their CBR600RR, GSX-R600 and ZX-6R models respectively, leaving just Yamaha’s R6 and Triumph’s Daytona 675 (three cylinders instead of the usual four, so allowed 75cc extra capacity) to contend the various Supersport race series. These machines are a little lighter than their big brothers and produce around 120bhp — enough to make them incredibly fast, but a lot more manageable. Younger riders needn’t worry though: the rebirth of the 400cc class, albeit in two-, rather than four-cylinder form, keeps the genre alive for those with little experience or on a smaller budget. Kawasaki’s new ZXR400 being arguably the most exciting of the latest generation of small-capacity sports bikes. You may get a few funny looks, but you’ll get kudos for your knowledge, trust us. Bikes with traditional handlebars that use engines derived from their sportier stablemates are nothing new. For years manufacturers have offered street bikes bikes with mildly-tuned versions of their sportsbike engines. Bikes such as Honda’s Hornet 900 and 600, for example, used revised CBR900RR Fireblade and CBR600F engines respectively. Yamaha, Suzuki and Kawasaki have all created similar machines, using derivative motors, often from an earlier sports model. These bikes are often a budget option, with less expensive forks, brakes and swinging arms. This has changed quite a bit over the years in keeping with the demand (mostly from older riders) for something with sportsbike power and handling but with a more upright riding position and better visibility in traffic. The latest breed of ‘hyper nakeds’ includes Yamaha’s MT-10 with an SP (Special Parts) version that features Öhlins suspension front and rear and puts out around 160bhp. BMW’s S1000R is easily identifiable as a stripped-down S1000RR and, like the Yamaha, hasn’t been detuned too much either. Pretty much every manufacturer has a naked (or unfaired) machine of this type in its range along with smaller capacity machines based on the same ‘hand-me-down’ premise, so there’s a sports naked for every rider, regardless of age and experience. Before these ‘hyper nakeds’ arrived, bikes without fairings were generally a bit boring. This spawned the age of the ‘streetfighter’: essentially sportsbikes modified with fairings cut down or removed along with riser clamps fitted to allow wide motocross-style handlebars instead of clip-on handlebars that attach to the upper fork tube. These are the real mile munchers. Gone are the days when long-distance riding was almost as much a test of physical as it was mechanical endurance — modern touring bikes are reliable, comfortable, smooth and luxurious machines to ride. Like so many others genres, there’s a wide mix of what’s deemed eligible but the big bikes rule this roost. BMW makes a vast array of touring machines, from the twin cylinder R1200RT to the latest K1600GT, all available with options to suit the individual. The Japanese rivals also have plenty to offer, with Honda’s VFR1200 and GL1800 Goldwing perhaps being the most sought after. Ducati’s Multistrada is also massively popular and a far cry from the race replica sports bikes that the Italian firm built its reputation on. If you’re looking for something that’s easy going around town, nimble in the corners and won’t take up too much space in the garage, then you really need to look elsewhere. These behemoths are designed for motorways, dual carriageways and fast, sweeping roads. Huge fuel tanks and sumptuous seats, for both rider and pillion, along with the ability to carry luggage make these the perfect machines for long trips across Europe — and beyond if you’re brave enough. Touring is all about exploring, so should you meet someone with a touring bike, then definitely ask them more about where they’ve been than about the bike. Ask them if they’ve toured the Alps, explored the Black Forest or cruised along the French Riviera. Say things like: “I can imagine these bikes are great for breaking boundaries and borders, going on road trips most bikers can only dream of?” If their bike has been used for its intended purpose, you can sit back and listen to their stories — maybe you’ll be inspired to get something that’s ready for the long run? Back in the good old days (if you don’t know when they were, ask anyone over 60) when it came to building the best bikes, Britain was a force to be reckoned with. In fact, it was more than that, with brands such as Vincent, Ariel, BSA, Matchless, Greeves, Brough Superior, AJS, Norton, Triumph and Royal Enfield, British bikes truly ruled the world. While the last three remain, the others have long since faded into memories. Nostalgia is a big thing in motorcycling and the Japanese weren’t slow to cotton on. Kawasaki’s W650 is pretty much a copy of the Triumph Bonneville, which the Hinckley factory still produces to this day. The European marques also love a bit of heritage. Ducati and BMW both have models styled to appease lovers of 60s and 70s machines. Retro bikes are not so much about performance as they are about emotion —they’re a real throwback to what many consider a ‘golden age’ of motorcycling. The riding experience is unique. Most are air-cooled parallel twins that sound fantastic and have a character all of their own. With these bikes you can really embrace the ‘café culture’ and buy all the cool old-school clothing to go with it. If style is your thing, and you like a bit of retro, then these bikes could be just the ticket. Purists may mock these reissues of a bygone age, but you’ll have the last laugh. Oil leaks and unreliability were a staple of motorcycling in the past, but these modern machines have no such problems. Last, but by no means least, we have customs. Not to be confused with the latest craze for heavily-modified old bikes, perhaps the most famous marque — and the oldest — is Harley-Davidson. Pretty much every manufacturer once had a custom or cruiser in its range, but the market is now dominated by Harley-Davidson. Retro in design, these bikes are all about chilling out and enjoying the ride — and looking cool while you’re at it. Bikes such as Harley-Davidson’s latest 48 Special are real head turners and can get quite a shift on when ridden properly. The American brand also makes huge touring bikes such as the Road Glide and Street Glide, fully equipped with radios and USB charging points. But at the heart of Harley-Davidson are smaller bikes such as the Roadster and Iron. Triumph still produces the Thunderbird and the Japanese, of course, had their own take (imitation) on these bikes, some with comical names that sounded more akin to an Ann Summers catalogue than a bike range. Suzuki, Honda and Yamaha have long since ditched their Intruder, Shadow and Virago ranges, but Kawasaki still has the excellent Vulcan. 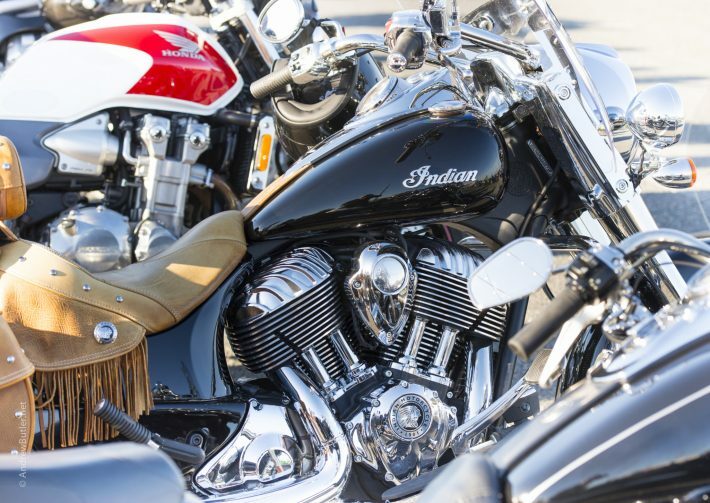 And those first three probably realized what they were up against from their US rivals — indeed we’re not sure why you’d want to stray from the American roots of cruisers and customs, with so many bikes from Harley-Davidson and Indian beating them hands down, especially in the cool stakes. Customs and cruisers aren’t for everyone, so don’t be surprised if you nod at a sportsbike rider and get nothing back. 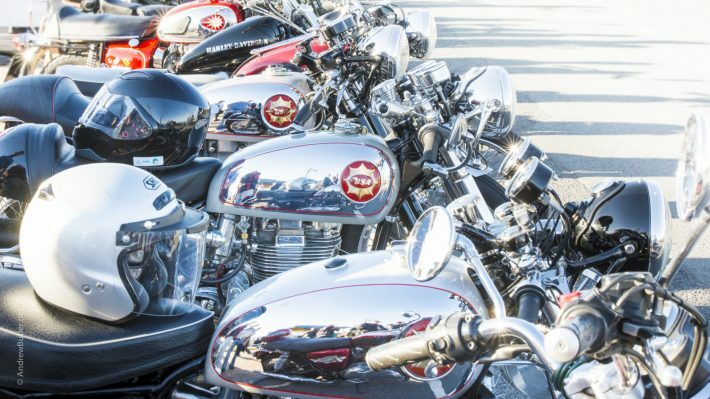 To many bikers, C&C riders are considered a completely different breed. But we say there’s nothing wrong with that and most who knock these bikes have likely never tried them. As their name suggests, these bikes are about cruising, chilling out and taking it easy; it’s always a ride and never a race. You’ll need to learn the lingo with these bikes to be able to hold court with a fellow C&C fan — so swot up on terms such as bobbers and baggers to get to grips with the vernacular.